The play kitchen is BY FAR the most popular toy in our home. It has been played with every single day for the past 7 years. In time we have gotten extremely good at improvising and coming up with new ways to keep things interesting in our play kitchen. 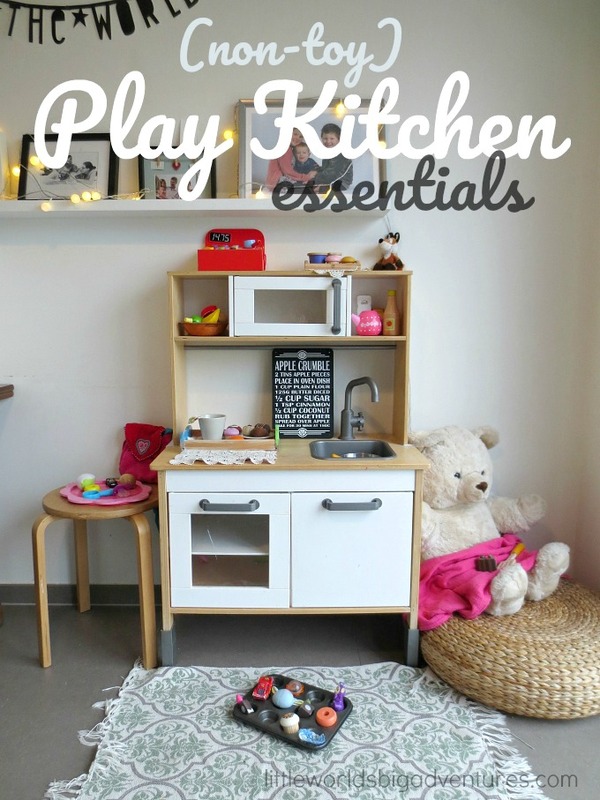 Today I want to share with you our list of non toy play kitchen essentials which promote open ended, imaginative and general creative play. 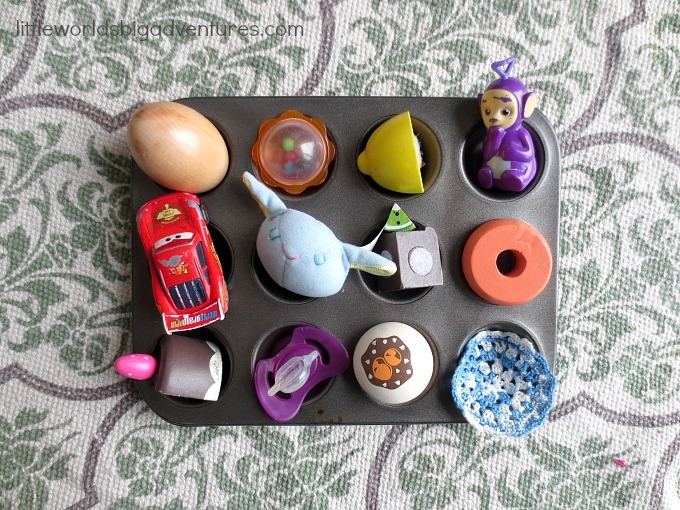 The good old fashioned muffin tin is probably the most underrated toy. It is perfect for sorting loose parts and especially well suited for cooking up all kinds of magic in the play kitchen. We prefer the mini muffin tin over the big muffin tin, but play with what you’ve got and a cute little mini muffin tin might make a great gift one day perhaps! Cupcake liners are inexpensive, versatile and fun. There are tons of arts & crafts that use cupcake liners but in our family they mostly live in the play kitchen. Our kids use them in the muffin tin or on (or as) bowls or on the serving tray and create masterchef type dishes in them. It’s superb. Felt tea bags are very easy to make (even when you say you can’t sew! use glue!) and they are absolutely adorable. Tea is a staple in any play kitchen, so it’s only correct that you have it in stock at all times. Small cardboard boxes can be used as cash registers, ovens, grocery bags, chairs, stoves, table, … You name it, they’ll play it. Small but sturdy cardboard boxes would be perfect. Since we now order everything in life on line, getting your hands on a decent cardboard box shouldn’t be a problem. Oh, how I love my serving trays. My kids may have picked up my serving tray enthusiasm somewhat because they have heaps of their own which they use and play with A LOT. A particular set of smaller ones live full time in the play kitchen and is used for every single tea party. Well, not everybody will agree, but I advocate to consider adding a real tea cup set to your play kitchen. The idea of using real tea cups is to teach your children from an early age to carefully manage materials and let them copy ‘the real world’ as much as possible instead of surrounding them with plastic. But, as I discovered for myself, that does not work for all children. It might have to wait a couple of years. Play silks are perfect for decorating tables, dressing up or building little tents for cosy tea parties. Every play kitchen needs a little chalkboard for message writing (or drawing!). We want to know when the kitchen opens, at what time, what the menu is or if the building has a new service such as grocery shop or ice cream parlor. This chalkboard will communicate it all. Bowls are the number one play kitchen essential. It is at the heart of all play kitchen pretend play that there needs to be something that resembles a bowl for the kids to cook in. These bowls can be any material, we’ve got little wooden ones we picked up from the thrift store, but any simple set will do. Spoons and bowls go hand in hand. Source them second hand if you can! Ah, the beautiful doily. Doilies are pretty and practical. Because of their round shape they can be used as stoves or to put hot pans on, as plates, table decoration, seat allocation, and so on. Felt pralines are more of a luxery than a bare necessity in the play kitchen, though some people would disagree on the grounds that every self respecting play kitchen should have at least one piece of chocolate. I wholeheartedly agree. These felt pralines are again easy to make, but if you just can’t face the project, feel free to outsource to Nana our Aunty. Someone will be more than pleased to make some for the play kitchen. Alternatively they could crochet some donuts! There are a number of reasons to start replacing most of our plastic toys with more eco friendly alternatives. From a play perspective, the biggest reason is the sensory aspect. A variety of materials such as wood, china, fabric and so on, provides a healthier (more diverse) sensory input which in turns helps develop those little brains. And there’s no need to blow the budget, small steps can go a long way. Now there you have it, the play kitchen essentials our family swears by. I hope you picked up an idea or two which will result in lots and lots of play kitchen fabulousness.